Earlier today, I posted an excerpt from the new memoir by Anna Quindlen, “Lots of Candles, Plenty of Cake,” (April, Random House). When she shared that piece, I asked her about her thoughts on parenting. Given her book’s attention to the generational shifts in child-rearing attitudes, I asked the expert at introspection, also a mother of three, which parenting trend from the past should be most embraced now and in the future. “When children are small, parents should run their lives and not the other way around,” she said. What is the single most important parenting lesson you learned from your own mother or father? BECOME A MEMBER of our ParentingToolbox.com Inner Circle when you like us on Facebook! Join the “Inner Circle” Membership FREE…Click Here! “I did search for what experts say when it comes to “timesaving tips for busy parents”, but I found their advice to be unreasonable and cumbersome. One site advised to “never come home angry.” Well sure, that is a fine goal, but if we can’t come home angry, some of us would never come home at all. Wear day/night clothing. It may be time to ditch the cute pajama pants and matching tank and invest in a wardrobe that meets your daytime and bedtime needs. A flattering pair of black yoga pants can easily transition from the bedroom to the playground. Not only will this save time crucial time in the morning, but it can cut down the laundry loads quite a bit. Utilize those babywipes for more than your tot’s tush! Instead of washing my face in the morning, I use baby wipes to clean the sleep from my eyes. Don’t be so appalled, I do buy the chlorine free ones. Never prepare an unnecessary meal. When my husband has one of his many dinner meetings, instead of making my own evening meal, I eat the leftovers on my daughters’ plates. Yum… carrot sticks and uninspired chicken on Disney Princess plates. Cut your daughter’s hair. On principle I keep the hair on my two young daughters’ heads well trimmed. I have yet to meet the parent of a girl that doesn’t suffer from the tiresome tangle battles. Neither of my girls readily allow me to brush their hair, nor do they have the ability to do this themselves. So, in my effort to avoid chasing them around the house, wrestling them to the ground and holding them in place with my thighs while I attempt to detangle the rat nests cultivating on their domes, I simply keep their hair no longer than chin length. Pretend you don’t notice. Some days my husband will arrive home from work shocked at the state of a room. “What happened?” he exclaims, the anxiety spilling from his ears. “Gee, I just took out the garbage and when I came back…” I answer, where in reality I have carefully stayed clear of the two girls who were ever so diligently painting the bathroom with a tube of toothpaste. Sure, the clean up will be bothersome, but it took them a solid 25 minutes of cooperative play to make this mess! Pajama Day! Is it really so horrible for your preschooler to show up to school in last night’s pajamas? I’m sure his teachers have seen it before. With my 2-year-old, the morning tasks are some of the hardest to get accomplished, so I often bring an outfit for her to change into at school if she so desires. Again, this also saves time with the laundry. Socks? What socks? Fortunately we live in the moderate Bay Area climate, where the temperature rarely drops below 48 degrees. Because of this, and Crocs made for toddlers, my girls almost never wear socks. They each own less than ten pairs and only wear them when we visit my parents in Oregon, during the winter … if it snows. By foregoing this extra layer of footwear, I save approximately thirty seconds each morning, in addition to a good ten minutes each Sunday desperately attempting to match pairs of tiny toddler socks. Skip the extra-extracurricular activities. My children are allowed one, two at most, lessons a week. In my opinion, their swimming classes are mandatory, but if we don’t make it out of the house for their 9 AM Saturday morning ballet lesson, we all kind of benefit. Putting away laundry is often a long, lonely and profoundly boring activity that takes up so much time. Babies generate a huge amount of laundry and cloth nappies. Toddlers and preschoolers with their rough and tumble, exploratory play. We eventually work out a routine but countless hours are devoted to it each week. Piles loom and perhaps get moved from room to room or chair to basket. Children love the side by side play while we are working. As I sweep he’s sweeping too. As I cook, he’s stirring too. They love to imitate and we can teach them in small steps how to do the larger things with the piece of apple technique. Let me tell you a quick story about the piece of apple technique. My boys love apples. If I quickly cut the apple into two huge slices either side of the core. 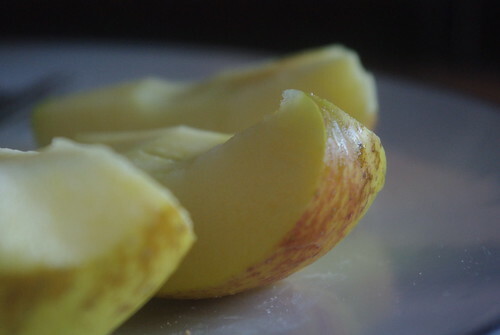 Cut those two pieces into three, then cut the two pieces off the odd-shaped original apple, we quickly have eight pieces of apple. Those apples when left on a plate disappear almost before the plate hits the table. Also when there’s one person eating the apple they are quick to eat it all. However, when I suggest they eat the apple by just biting it, perish the thought now, the apple isn’t often finished. It’s not a satisfactory outcome for me the apple buyer and them the apple eater. They need to eat one piece then the next piece and so on to complete. It won’t always be like that but right now this system works for us both; the piece of apple technique. So what does this story have to do with laundry? We need to give our children a piece of the apple by teaching them and training them in the laundry process; piece by piece. Eventually they will be able to eat the whole apple and not blink an eye. Ron Huxley Eats: I love simple parenting techniques and this is as basic as it comes…thankfully. Teach children to do tasks one step at a time but remember to teach them. Don’t yell or threaten to get compliance. Parents have to look at the job of parenting when in a challenging moment with a child. Although many fathers today spend more time with children than was the case in the past, physical care of young children remains primarily mothers’ work. Yet some fathers claim that they do work traditionally seen as the “mother’s job” every day. Using subsample data from the male respondent file of the National Survey of Family Growth 2002 (n = 613), this study examines factors associated with married or cohabiting fathers’ daily involvement in physical care of children under age 5 years. Logistic regression results show that daily involvement is more likely if fathers were raised by their biological fathers, received more education, have employed wives or partners, have a young male child, or receive public assistance; it is less likely if they have school-age children. This study suggests that paternal involvement in physical care of young children is shaped by multiple factors including childhood experiences, education, economic conditions, and current family context. Ron Huxley Remembers: I was one of those very involved fathers who attended the child birth classes, got up for the bottle feedings at 2 a.m. and changed diapers. Many dad’s don’t, even in modern society. It still seems to remain largely the mothers role to take care of new babies. Dad’s who do diapers depend on several factors, according to this research, including how they were raised, their temperament, and their economic status. Ron Huxley: This isn’t one of the most talked about parenting tools on blogs or parenting classes but it is one that can shame the toughest child and frustrate the most competent parents. This infographic has some very helpful advice for mom and dad. Get more power tools now in the “inner circle” membership club!